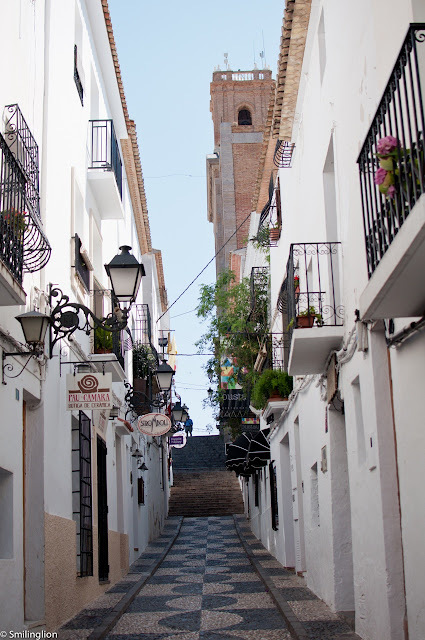 Altea is a small and relatively quiet seaside town along the Mediterranean. Unlike its neighbouring towns (albeit much larger ones) of Benidorm and Alicante (both of which are rather important summer holiday destinations, especially for the Brits), Altea has largely retained its rustic charm. 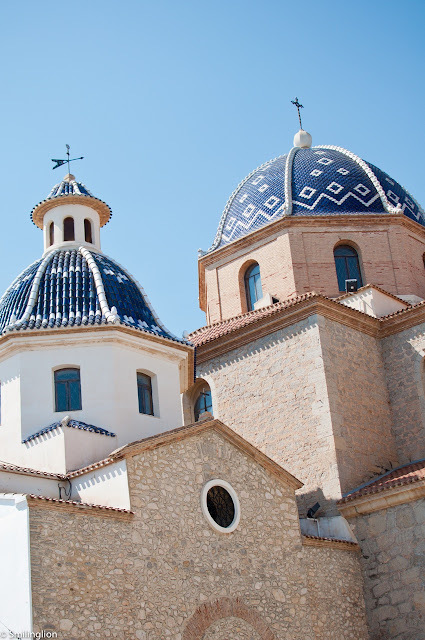 Away from the bustling beach, the iconic church of La Mer de Deu del Consol, with its azure ceramic domes, overlooks the old town. We thought the short walk up the hill to the church was worthwhile, as it brought us through a charming labyrinth of whitewashed rows of houses on the way up. We were staying nearby (at the SHA Wellness Resort about 15 minutes drive away) and took the short journey to Altea for dinner. Having just landed in Barcelona after a long flight from Singapore, and then driving almost 5 hours south, we were prepared to chill out and have a light dinner while working out our jet-lag. 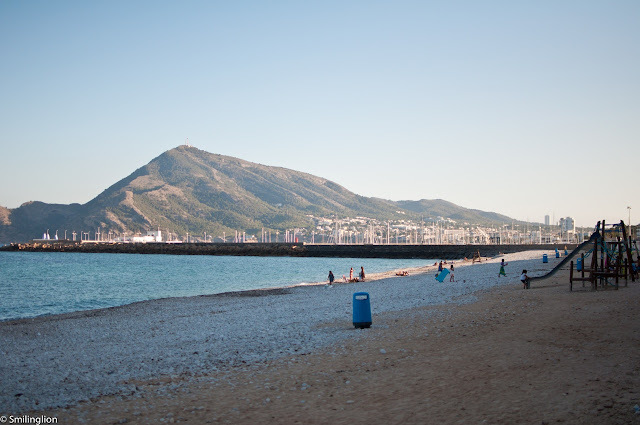 Before dinner, we spent a good half-hour strolling along the beach, which was small compared to the much larger and busier beaches of Benidorm and Alicante. It was a leisurely stroll, and despite it being a Saturday summer evening, wasn't too crowded. We were wary of having dinner at any of the restaurants along the beach stretch of Altea, as many of them appeared to be tourist traps. 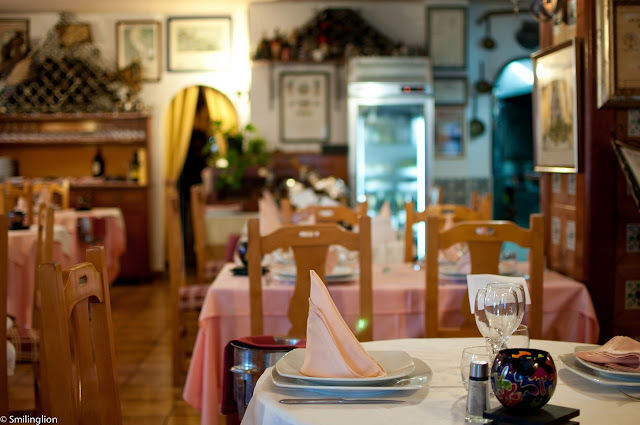 It didn't help that there was an unusually large number of Chinese and Japanese restaurants there, and many of the Spanish restaurants looked more like watering holes than those which would serve serious food. Hence, we consulted the Repsol Guide, which is Spain's equivalent of the Michelin Guide for France or the Zagat Guide for the US (this guide was downloaded on my iPhone but was only in Spanish so it was a bit of a challenge to decipher). 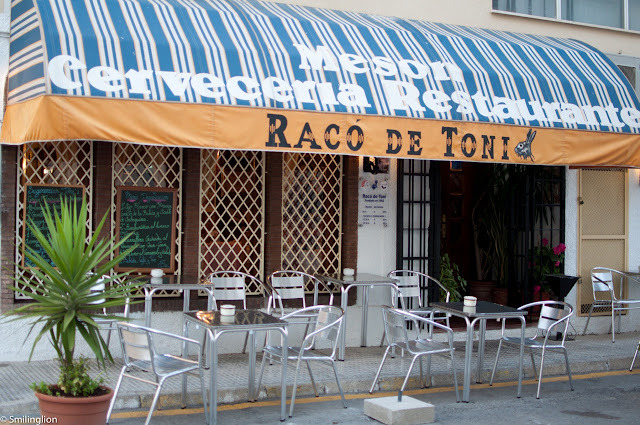 The Repsol Guide directed us to Meson Raco de Toni, a traditional Spanish seafood restaurant on the street just off the beach. Raco de Toni looks like a restaurant which has seen better days. It had the appearance and decor of a 80's tavern, with walls filled with framed accolades and awards which hinted at past glories. Although we were there on a Saturday night in summer, it was totally empty and for the duration of our meal there, we were the only table. Whether it was because of the general economic malaise which Spain and the rest of Europe is experiencing or any other reason relating specifically to the restaurant and its food, we hoped it was the former, but to be fair, there wasn't much of a crowd in town that night in any case. The waiter spoke limited English and I spoke even more limited Spanish, but between us, we were able to understand each other. He was very friendly and helpful, and was able to make some recommendations for the food. As it turned out, the portions, even those which were labeled as 'tapas', were quite large, and we realised why the waiter was quite reluctant to allow us to order more than we did. 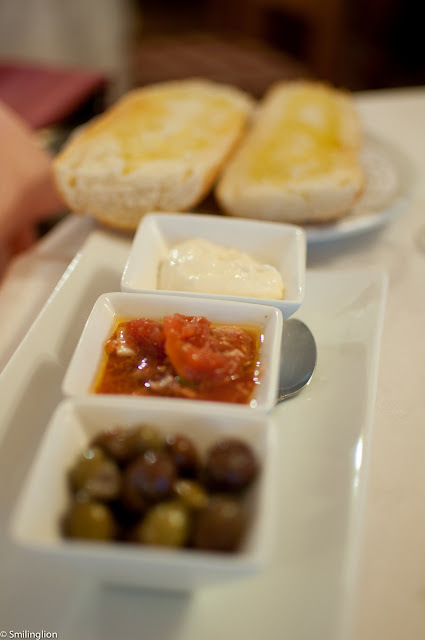 The toasted bread was accompanied by three dips; the aioli, tomato and olive. The aioli in particular was quite amazing. The wine list only had 3 wines from the same producer, and we went with the half-bottle of Ribera del Duero which was quite decent. Pulpo a la Plancha Sobre Patatas y Refrito de Ajos: The large octopus tentacles were beautifully grilled without being overcooked, and though we felt they were slightly over-salted, the bed of boiled potatoes took some of the saltiness away. 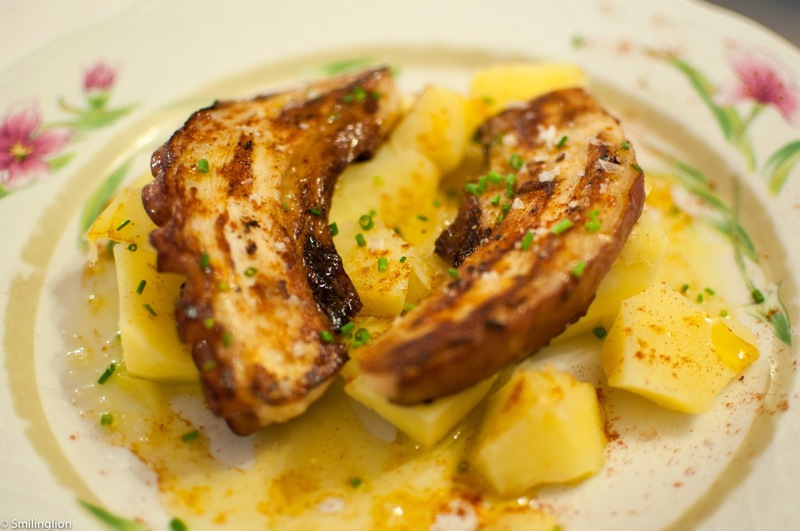 Sepionet de la Bahia: Like the octopus, the squid was very fresh and we were quite amazed by the thickness of the square chunks of squid. 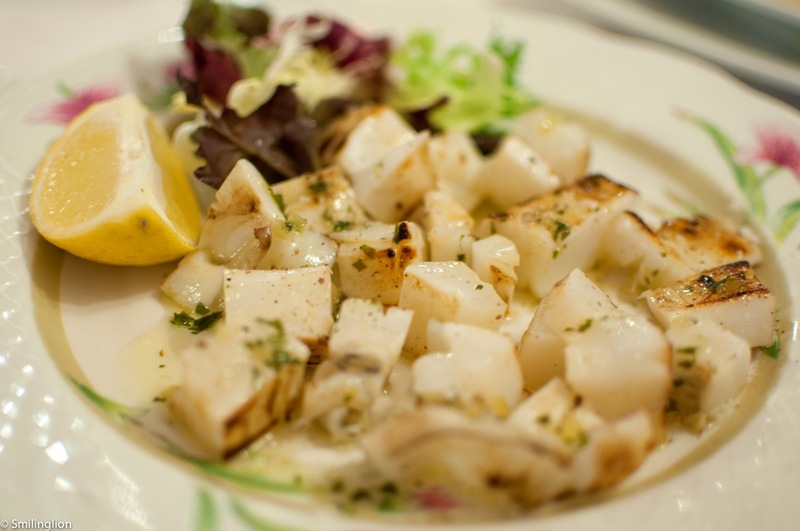 Similarly, the squid was lightly grilled yet was still very juicy. It was served very simply with salt and olive oil. Paella Mixta Alicantina: Back home, we were used to paella being served on small plates but apparently in Spain, it is a meal in itself for 2 or more people. 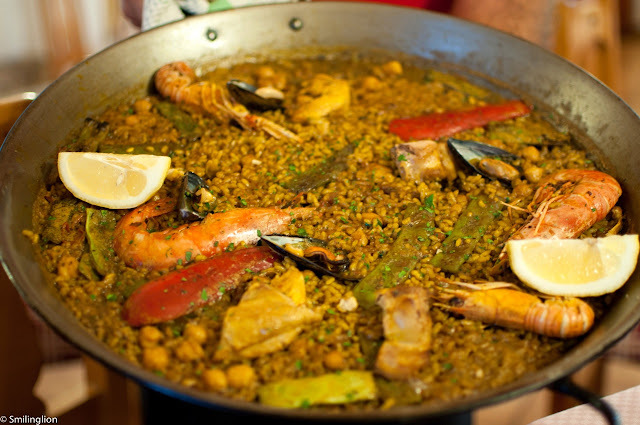 When the paella pan was brought out, we realised why the waiter was so vehemently insisting that we didn't order a main course each (which was what we had intended to do), as the pan was massive! And when the rice was apportioned on our plates, it looked quite a daunting challenge to finish it. The rice was very flavourful and the texture was perfect, but at the end of it we were totally stuffed. 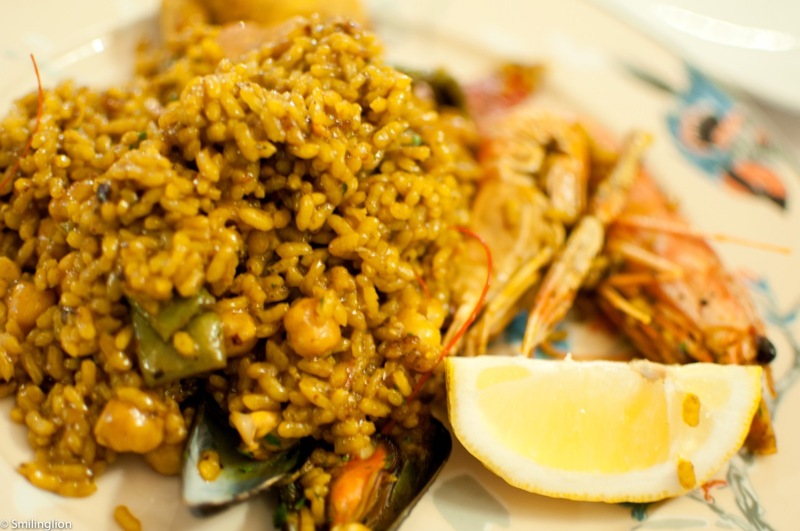 One thing intrigued us though; we always thought that authentic paella would never mix seafood and meats, but this version had both prawns and mussels as well as chicken and rabbit. 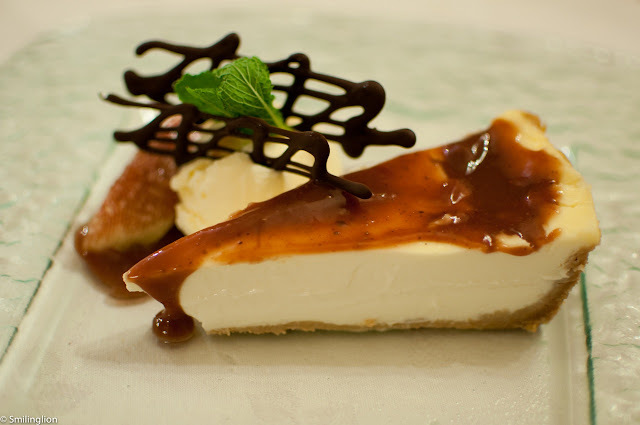 Tarta de queso: Their version of the cheesecake was quite unique, as the cheese was very soft and milky, and had a texture not very different from a panna cotta. It was very good. Final Thoughts: We enjoyed our dinner at Raco de Toni. The food was good, the service warm and friendly and the prices quite reasonable. There wasn't much of an ambience to speak off, as we were the only table that evening (we left at 10pm and it was possible that they had other guests after that), but we were looking for a good casual and simple meal and we got that here.